all of the strings come together. two which covers an oversized tag. beautiful images available to us for use in our creations. I love how natural she looks! to leave me inspiring comments - thank you so very much. So lucky to be alive!!!! OMG Suzy, those tags ( tags? they are not just tags, they are amazing collage hangers ), they make my heart beat faster, they are amazing! And I am so glad to see the photos of your strings for the heartstrings project, they turned out ever so well. I love the dinky little nest you made, its awesome! Oh, I wish you would hurry up and complete it, lolol, it is going to be stunning. Wow Suzy you have been so busy and making such gorgeous creations! Congratulations on the DVD, I know it will be a huge success! Suzy, your tags are just gorgeous! I love the pattern on your new stamp, and I'm looking forward to seeing your heart strings! Lovely work so many treasures hidden away in each picture. As for sweltering in the Northern Hemisphere - in the UK we're getting lots of rain. We've had our wettest drought on record and the hose pipe ban they enforced in April in many areas was called off a month later! Suzy, I am in awe of your talent. Your work is beautiful, enchanting and enticing to the senses! What a beautiful piece of work is your 'Heartstrings', it's so good to learn a completely different technique, it will add a new dimension to your work I'm sure. those tags are so very special, I love the colours. It is great to visit such a talented lady. It's so strang to think you're in winter when we're in summer here!!! Beautifull works! You're more courageous than me! You are coming along, your first photo of the beginnings are beautiful! All of the rest of your work shown is magnificent, as it always is! I so love coming by to see your work. I, too, am looking forward to your new art form becoming a reality and you showing us all of the beautiful things you have for us to see! Have a wonderful new week, Suzy! Tak for at kikke i din blog Suzy, jeg fik rigtig meget ud af det, for der var oversættelse til dansk. knus morkaren. I can tell you know using textiles in jewellery making is going to be seriously addictive. It just creates a look that is so unique and a great way of developing your own signature style. Everything is just gorgeous! Your jewelry and book covers are so inspiring!! More gorgeous work Suzi, your jewellery's looking fabulous. Your tags are works of art. Stunning. Love the jewellery components in your artwork. Your Heartstrings class looks so very creative! I love what you have done so far...all those jewelry pieces, and the nest is fabulous! Your fabric collage tags are amazing, each one...but I love love love the last one! Enjoy your winter...here we are in super hot weather and pray for rain. Your tags are beautiful, and I can't wait to see more of your class projects! Hello my dear Suzy, That looks like a lot of fun and your strings turned out beautiful. The finished piece will be awesome for sure. Your tags are gorgeous as always. The new stamp is very pretty and makes a great background for your so lovely creations. Have a wonderful rest of the day :-)! what a "nest" of treasures coming here, OH MY GOODNES , your heart strings will be such an adventure to see, when totally finished,like being in a fairytale- and your ATC`s sweetest friend, they are just stunning Suzy.Your stamps looks amazing even used on fabric... and the little collages are beautiful works of art. All so fifferent, all so amazingly small wonders. I can look at them for ever! I`m home -missing- sweet heart you will hear more from me tonight. Such a gorgeous piece Suzy! I love all the beautiful details. I also love the new blog layout! it really makes your artwork pop! 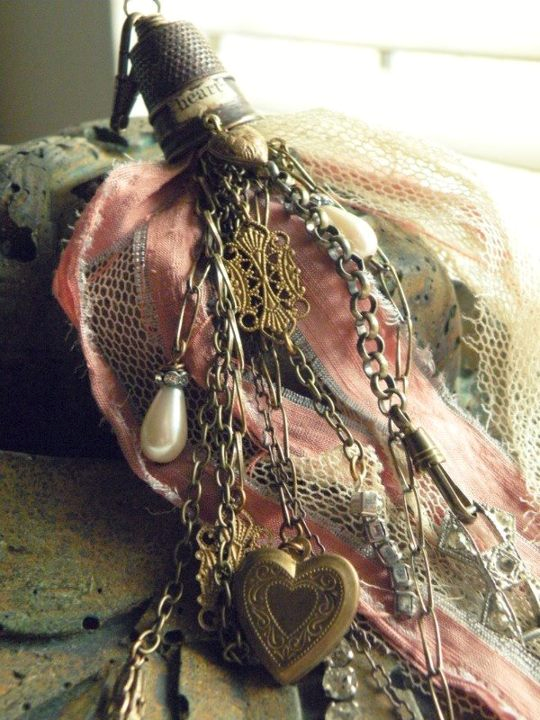 I drooling already over your heart string beginning...such a perfect use for special treasures. And the tags - what can I say that hasn't already been said? Oh Suzy, you are having such a lovely creative time with the latest works.Love your tags, and the jewellery is coming along a treat. Looking forward to seeing what comes from your studio as you explore this new medium. I'm swinging a leg for you! I love Dianes heartstrings too - she´s so talented. Love your tags too Suzy - so beautiful and detailed. Your art is absolutely stunning--I just LOVE the tags, so beautiful! Your piece is as beautiful as I knew it would be since you are a master at combining beautiful things. I adore your tags as well Suzy. I wonder if you know how much you inspire me? I love your Heartstrings Suzy - they are looking wonderful! I am sure this is going to be a fabulous workshop for you and will flood you with all sorts of new ideas. Your tags are also wonderful - so much effort, and so obviously worth while - they are just lovely. We are just finally getting some heat here after months of rain and flooding - it's a welcome change! These are so much more than tags. Suzy, you always have the most amazing images as the focal of your creations. As for that stamp, I have had my eye on that set of stamps and was convincing myself I wouldn't make enough use of it but you are making me re-think as I can see the versatility. Stunning artwork that truly inspires.